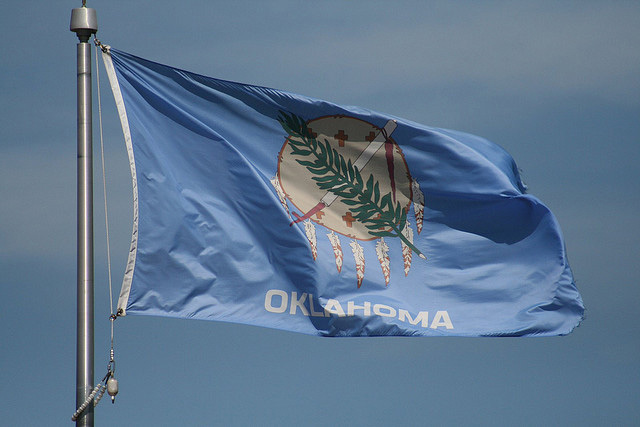 Flag of Oklahoma; photo by Les Stockton on Flickr (noncommercial use permitted with attribution / share alike). The blue field signifies devotion, the shield is a symbol of defensive or protective warfare, but always surmounted by the olive branch and peace pipe which betoken the love of peace by a united people. "I salute the flag of the State of Oklahoma. Its symbols of peace unite all people." A sky blue field with a circular rawhide shield of an American Indian Warrior, decorated with six painted crosses* on the face thereof, the lower half of the shield to be fringed with seven pendant eagle feathers and superimposed upon the face of the shield a calumet or peace pipe, crossed at right angles by an olive branch, as illustrated by the design accompanying this resolution, and underneath said shield or design in white letters shall be placed the word "Oklahoma", and the same is hereby adopted as the official flag and banner of the State of Oklahoma. 4. The name Oklahoma in white letters shall appear under the shield on the face of the flag. 2. Colors shall be colorfast and shall not bleed one into another. It shall be the duty of all state agencies and boards of education of this state to display the state flag with the standard design and colors as specified in Section 91 of Title 25 of the Oklahoma Statutes. SECTION 3. This act shall become effective November 1, 2006." *Crosses are the Native American symbol for stars. 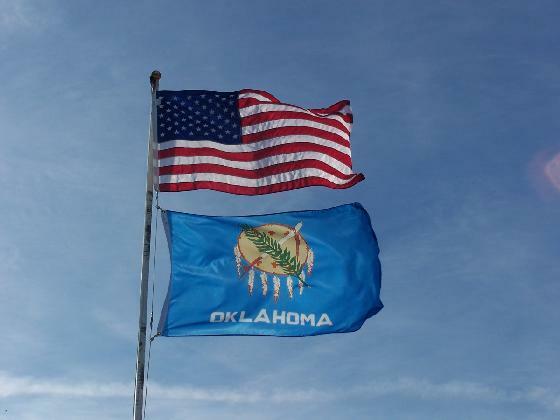 Oklahoma flag flying beneath the American flag; the small crosses on the Indian war shield in the center of Oklahoma's flag are Native American symbols for stars. The peace pipe and olive branch that lie across the shield are symbols of peace. Photo by J. Stephen Conn/Flickr (noncommercial use permitted with attribution). 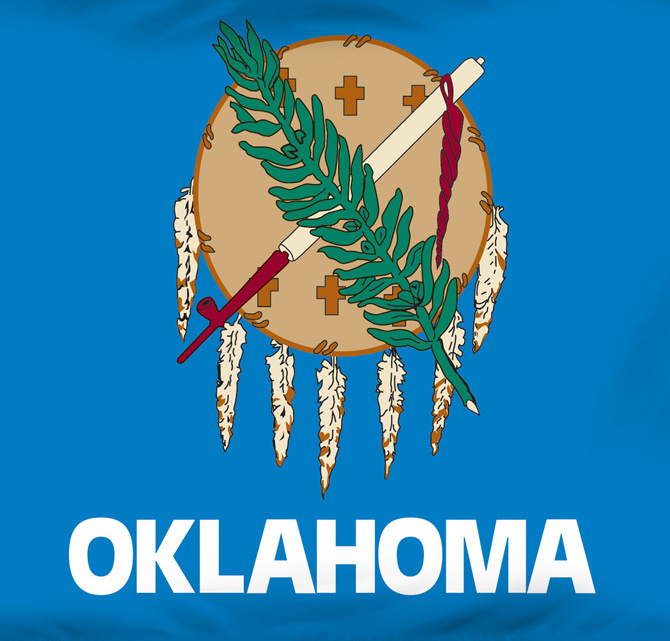 Details on Oklahoma's flag include a Native American war shield, seven eagle feathers, a peace pipe with tassel, an olive branch, and six crosses that represent stars. Public domain photo.